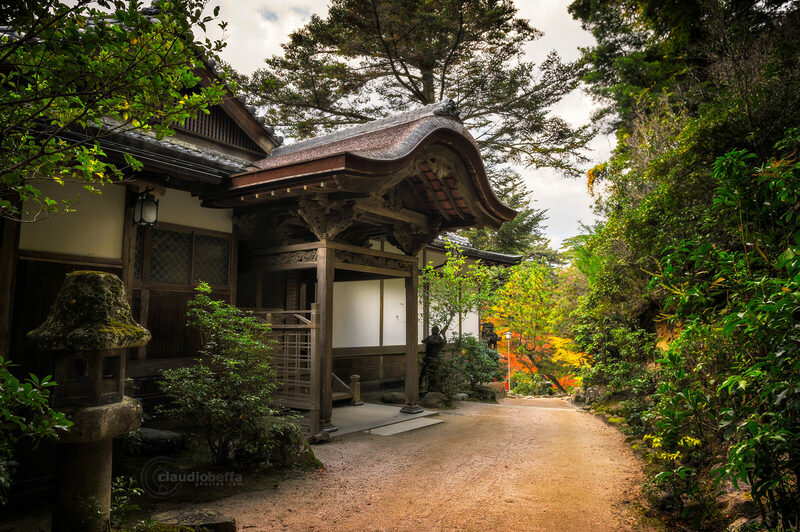 In this third article of the “Autumn in Japan” series, I’ll show you some glimpses of the beautiful island of Miyajima, Hiroshima prefecture; to be precise I’ll focus on the colors of the Momijidani park. The island of Miyajima (which means “shrine island” and whose name, in reality, is Itsukushima) is a world-famous destination for its cultural, artistical and religious peculiarities, as well as for the enchanting beauty of its natural side. During my two-months-long adventure in Japan of last year, I’ve spent three days on this island, taking a ton of photos of its amazing shrines, temples, forests and landscapes and also a religious event in the Shinomiya Shrine. I’ll tell you of these things in future articles because in this occasion I want to focus on the beauty of Autumn but, believe me, don’t make the mistake to limit your visit to the main (and most accessible) attraction, that’s the Itsukushima Shrine; the island of Miyajima is a pearl that deserves to be explored. Getting to Miyajima is quite straightforward: assuming that you are in Hiroshima (that’s the most common and logical starting point), you just need to take the “Hiroden Main Line” tram; once crossed the western effluent of the Ota River, you can choose to continue on the Hiroden Line at the Hiroden-Nishihiroshima Station until you arrive to Hiroden-Miyajimaguchi, or to take the Sanyo Main line from Nishi-Hiroshima Station to Miyajimaguchi Station. It’s not difficult at all, the two lines run parallel so it’s up to you which one to choose. Once arrived at one of the “twin” train stations of Miyajimaguchi, you’ll need to hop on the ferry which will take you on the island. Again, there are two identical ferry lines which shuttle back and forth (the JR West Line and the Miyajima Matsudai Kisen), they cost the same and take the same amount of time to cross the channel so, once at the pier, just take the one that departs first. In any case, if you wish to know more or if you plan to reach Miyajima by car or by plane, you’ll find on the Miyajima Tourist Association page all the options, time tables and fares. From the tiny and lovely town of Hatsukaichi you can choose to undertake the most various experiences: many tourists stroll on the shopping and restaurant streets, visiting the near Itsukushima shrine, whose giant torii stands in the middle of the bay; other visitors take the ropeway to reach the summit of Mount Misen, where is possible to visit the Dainichido buddhist temple, as well as enjoying a great view of the surrounding land. But in Autumn the best place to see is undoubtedly the Momijidani park, that you can easily find at the back of the Shinomiya shrine, just outside of the town. 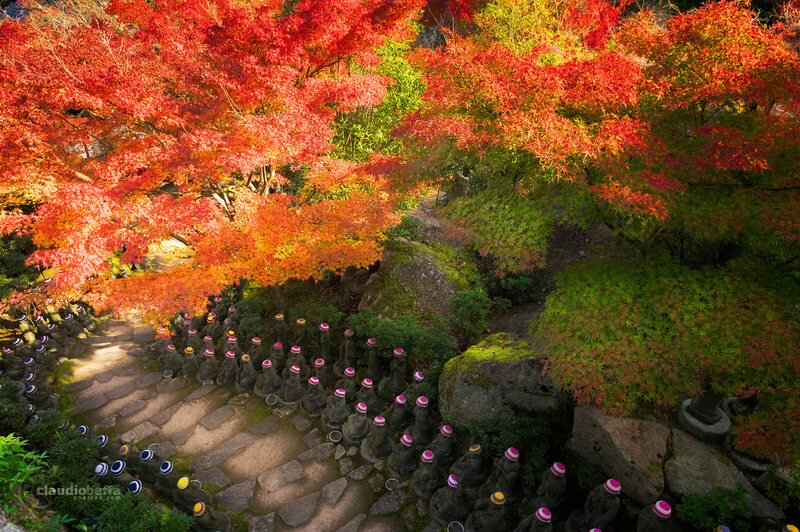 The Momijidani park is one of the most famous and appreciated place in Japan to enjoy the beauty of red Momiji leaves. The “valley of the maple trees”, that’s the meaning of the park’s name, has been conceived during the Edo period (1603-1868) when the maples have been planted. The walk offers some unique and amazing view: the small bridge which crosses the brook is a wonderful point to admire the beauty of the place and actually it’s always pretty crowded. There I had the chance to attend a “fashion show” of a little girl; walking in a wonderful park in autumn is great, so why not catching this occasion to do it with style? So the parents have dressed up their daughter with a colorful kimono, decorated with symbols of long life and luck: needless to say that the little girl instantly became a superstar, attracting lots of tourists and photographers who wanted to capture her “cuteness”, maybe too many, judging from her mixed feelings that you can see in my shot. 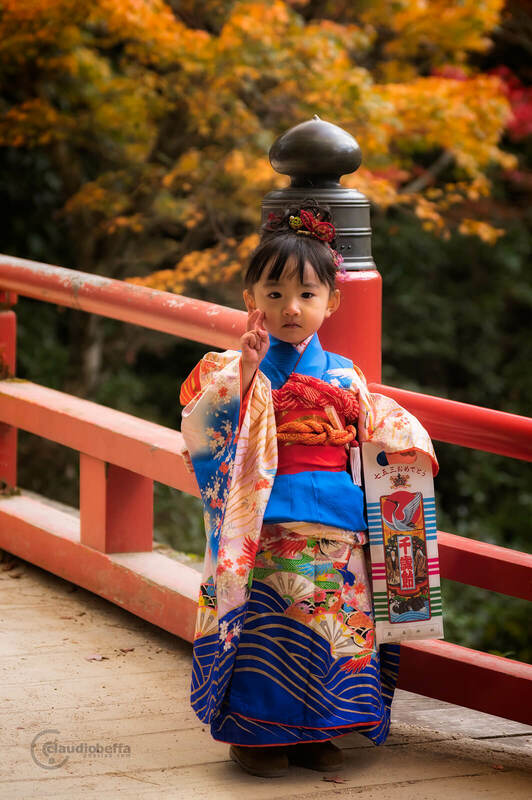 A little girl in kimono during a walk in the Momijidani Park, Miyajima, Hiroshima, Japan. In the nearby of the first bridge there’s a deviation from the main path, along which you can find some traditional tea houses: they are surrounded by trees and low hedges and their natural colors make them almost mimetic. As you probably know, the japanese traditional houses have a structure made of wood, with the walls composed by a mix of sand, clay and straws; the shoji are made of rice paper over a frame of wood and the shingles of the roof are ceramic. All these natural materials blend in perfectly with the surrounding elements and, most of the time, they literally “combine” with them, since the humid climate favors the growth of moss on the outside of the houses (besides the stains of damp). 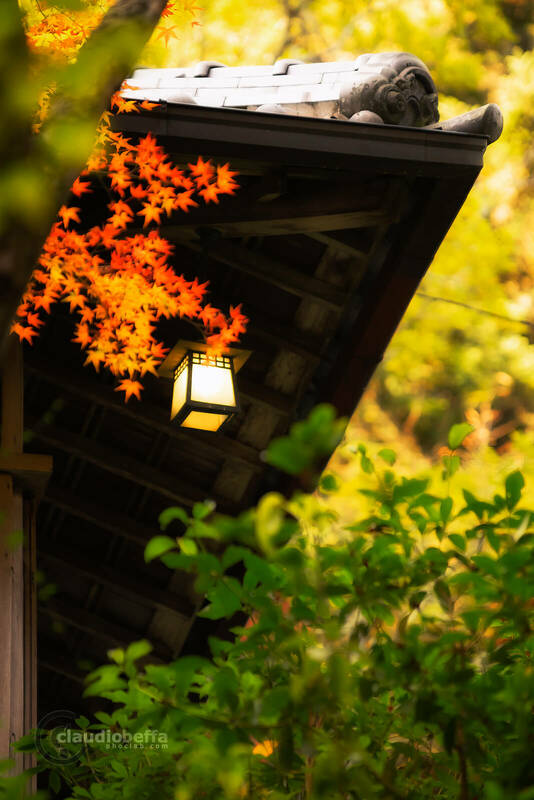 What catches your attention, anyway, is the feeble glow of the lanterns hanging below the corners of the roof: they pop out from the vegetation as you walk in the vicinity and make you enjoy the relaxing walk even more. A tea house ryokan inside the Momijidani Park in Miyajima, Hiroshima, Japan. The small path that runs along the brook brought me to a dead end which held me a surprise: a vantage point on a small waterfall, flowing out from the forest; it was clearly shaped by the hands of man, nonetheless it was beautifully in keeping with the environment. 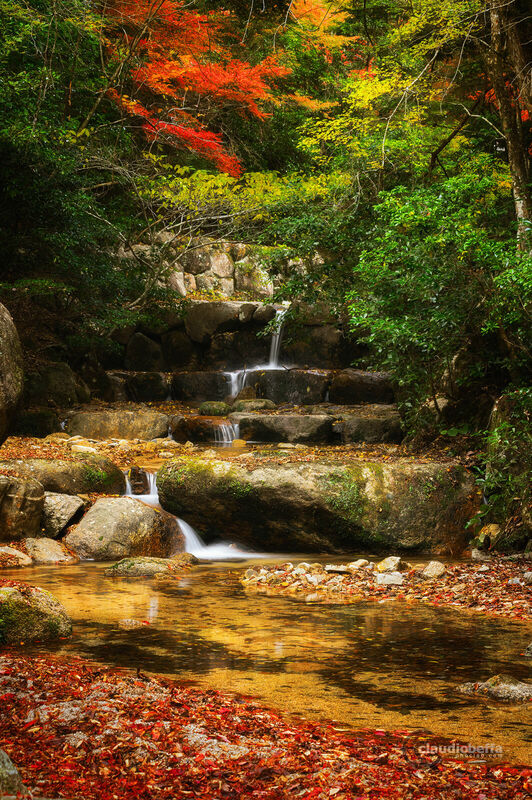 A rivulet of water, after four small jumps, was feeding the calm brook, bringing with it the fallen leaves and reflecting the warm colors of Autumn. I composed the shot quietly so as not to break the magic of that moment, enjoying the beauty of all those colors and happy to have decided to follow a path that, at first glance, didn’t seem to lead anywhere. Going back to the main path I continued the walk between the beautiful red momiji trees, appreciating the luck of a perfect sunny day as all the other tourists did. As the afternoon was painting everything with its warm light, I found myself near the gate of the Shinomiya Shrine: in that place there’s an enchanting staircase of stone, surrounded by hundreds of Jizos. 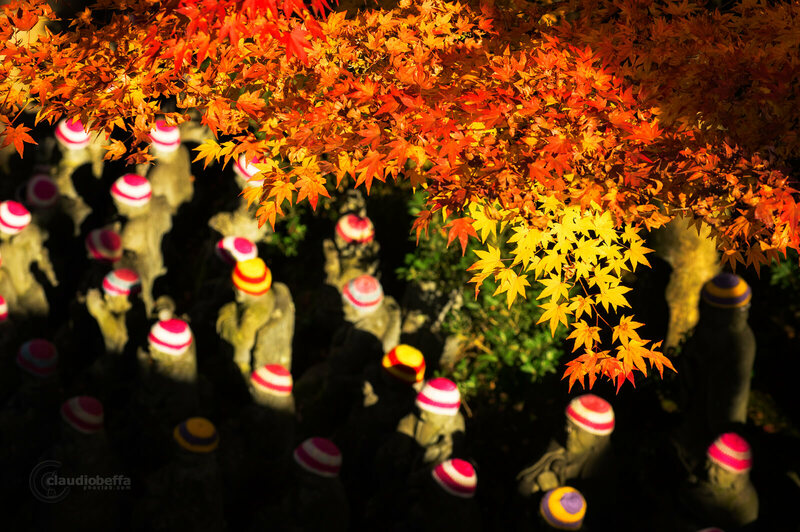 Those many little smiling statues, often dressed up with colorful skullcaps and scarfs, represent the Bodhisattvas who protect the travelers, children and women. The staircase is commonly photographed while walking along it, taking close-ups of the statues; I’ve found an alternative point of view, specifically by passing the shrine’s gate and then looking below: you’ll see an overview of the path with the many Jizos and the Momiji, which frame the scene. A lovely sight that I suggest you to find, if you visit the Shinomiya Shrine. Japan is a land that never ceases to amaze me and it’s so rich of natural wonders, cultural and traditional events and captivating lifestyle that’s nearly impossible not to be enchanted by it. In this case I’ve showed you just a glimpse of the beauty of Miyajima and the Momijidani Park (so I promise to present many other photos in future articles), but I hope that this could be sufficient to make you consider adding this destination to your travel agenda in case you’re planning an adventure in Japan. As in the previous posts, I suggest you to refer to the map of autumn colors of Japan to have a reference of the peak days depending on the latitude, and also keep an eye on the Autumn color report 2016 to know in real time the situation in the most scenic places. 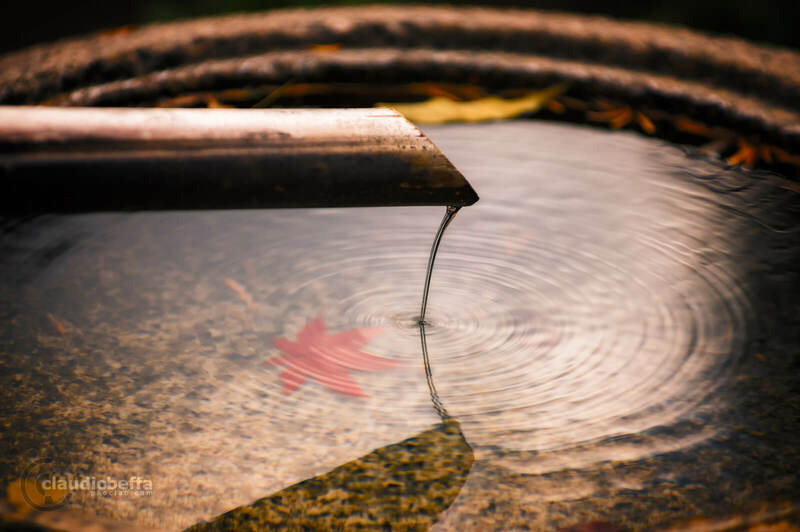 A red leaf of Momiji tree fallen in a water basin made of stone (chouzubachi) marks the autumn ending. NOTE: You can find the photos of this blog post in my personal Google+ stream. Drop a +1 if you like them!